Central America: Atlantic slope, from the Aguan River (Honduras) to the Moín River (Costa Rica); Pacific slope from the Yeguare River (Honduras) to the Bebedero River (Costa Rica). On mature males the black lateral lines are solid, whilst the females are broken along the body. The males are generally more colourful than females. Females can be more yellow in colour than the silver-blue males. These fish will breed in captivity. 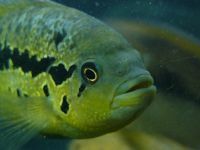 A large and aggressive Cichlid that should be kept one to a tank, and best in a species tank. It will eat any fish smaller than itself and is perfectly capable of tearing apart any fish of similar size or larger. A pair can be considered but must only be kept together in a very large tank. An unfussy eater, will accept cichlid pellets and live/frozen foods such as silversides, shrimp and krill. They require a spacious tank with planting and bogwood décor. Excellent filtration is a must. Males are highly aggressive towards other males of its own species, especially when in the small confines of a tank. Will predate any other fish in the environment. The base colour is gold, with a lavender iridescence, there are thick black lateral lines along the body. They have sharp visible teeth.